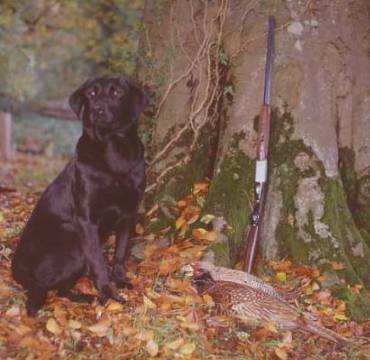 Steve Shaver of UT got this shot of 11 month old Lucy on her first pheasant hunt. Steve says she's figuring it out nicely! 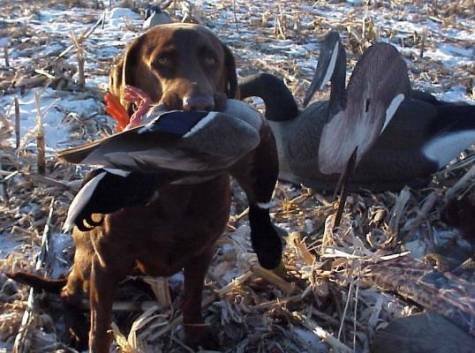 Darryl Hudson of Latrobe, PA had a great early season as did his female chocolate lab Cocoa! Jim Belmont and Cappy, of Las Vegas, NV win the blind paintjob matching camo jacket contest! 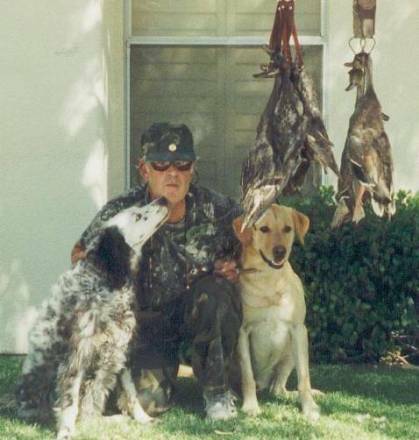 Jim is shown with an early season Nevada pair of mallards (center) and on the right with Lewellyn Setter Duke and cap after a morning in the blind. 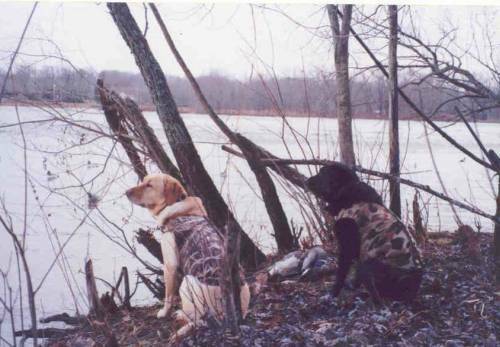 Cray Stephenson is waiting on Minnesota geese with Bear, a client dog. Center pics - a MN goosefield at sunrise and a closeup of Bear. 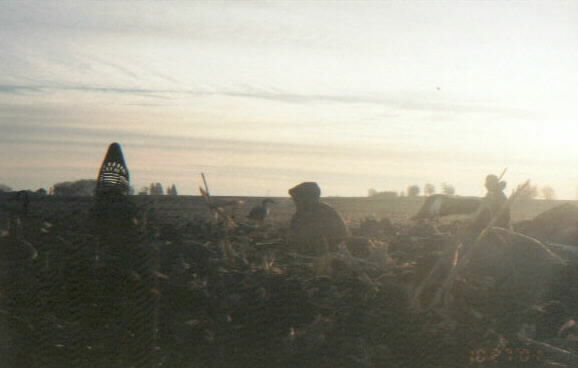 On the right is Laurie "enjoying" the cold cut cornfield. 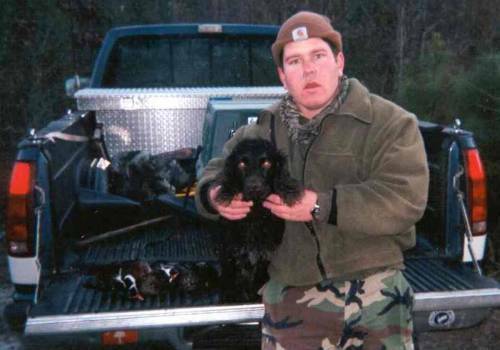 Rob Heilig and "Gumbo" pose with some woodies after a SC duck hunt. And no, it's not a "swamp poodle", it's a Boykin. Well, OK...it's both! They had to break ice on this hunt - rare in SC. 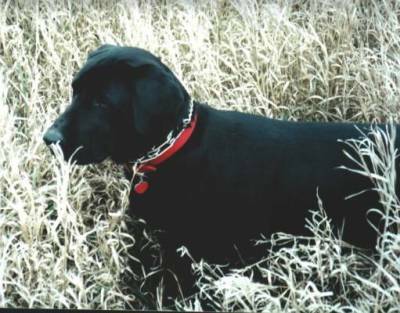 Nimrod of Ireland's lab after a hunt. 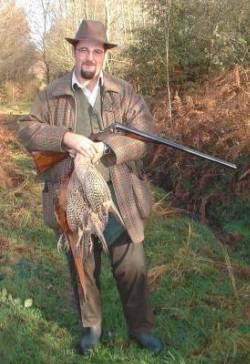 Dressed for a day's shooting in Ireland. Two Irish labs with a day's bag. 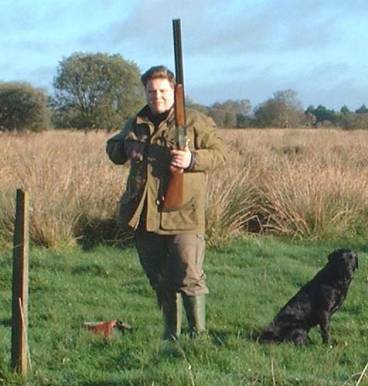 Nimrod's son Neil with young lab Sam standing at the "peg" waiting for the first drive. 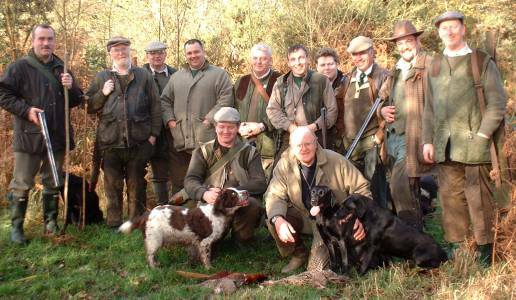 The guns, the beaters and the dogs at an Irish hunt. 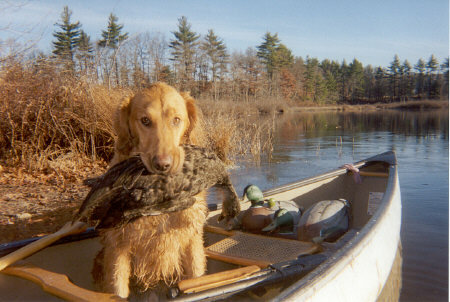 Ranger is owned by Ron Green of Phoenix, Arizona. 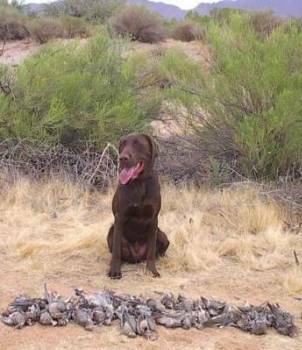 The left picture shows ranger after a September desert dove shoot. 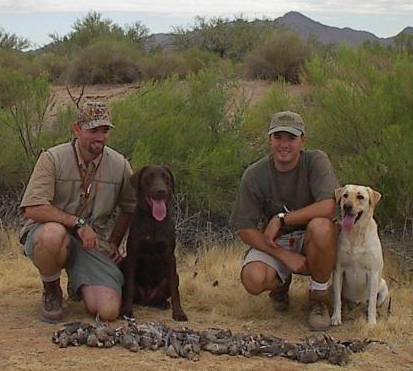 On the right Ranger is pictured with the boss Ron next to partners Eric Hoffman and Scout. 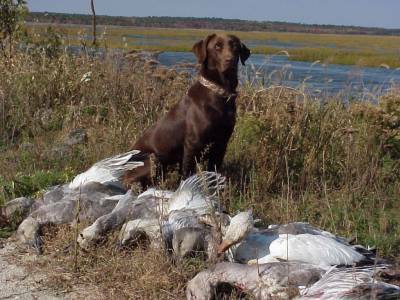 Dave Weidner of the Navesink Hunting Retriever Club (New Jersey) sends these early season pics of his 2 year old WR Atwater Seaglass N the storm JH dawg. 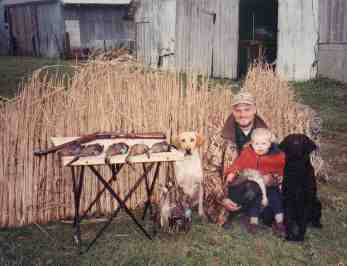 Roy O'Dell's dawg Shadow at age two with a Widgeon (left) and a Gadwall (right). 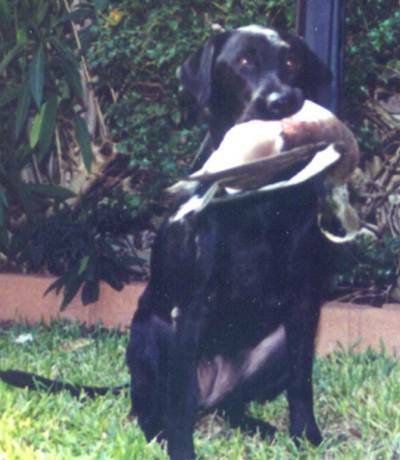 Roy is from Fort Worth Texas and is a member of the Cowtown Hunting Retriever Club. 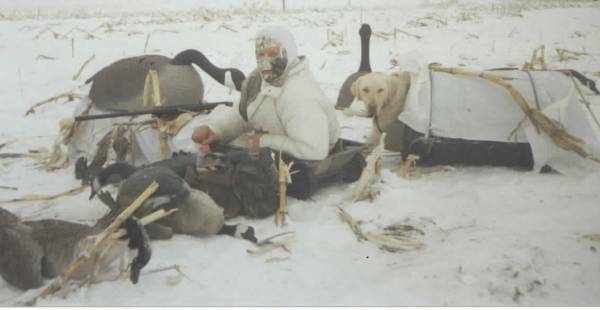 Norm and Kerri Lynch of Lanark, Ontario Canada own 9 1/2 year old Cedrick (left) pictured here with three hunting buddies. Gracie is pictured (Right) with brothers Norm and Wally Lynch. She is the 5 year old daughter of Cedrick. 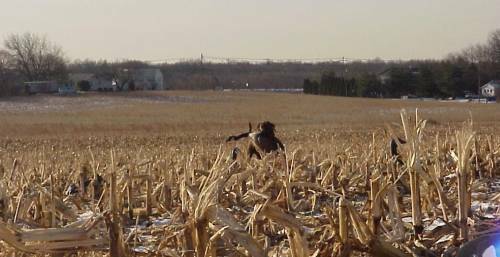 Darren Wallace took this action shot of Lucy during a Mid-West pheasant hunt this Fall. Lucy 's training all paid off on this trip! 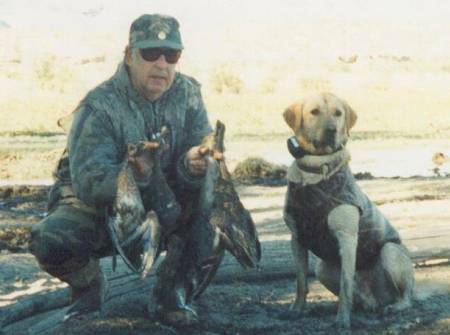 Gerry the dawg is shown in this picture after a successful Idaho Pheasant hunt. Gerry is owned by Alex of Fair Oaks, California. 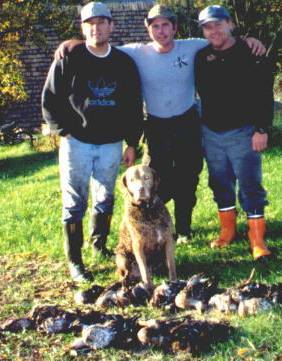 Donny, "Da man" Morgan owns Lily seated next to Teddy (owned by Dan Richardson) in the left hand picture after an early Fall Pheasant hunt in upstate NY. 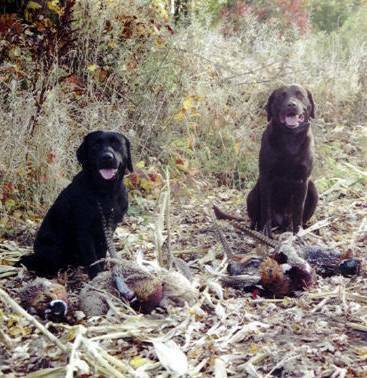 On the right is Donny and Lisa Morgan's "Zack" after a Fall Marsh duckhunt in the Rochester, NY area. 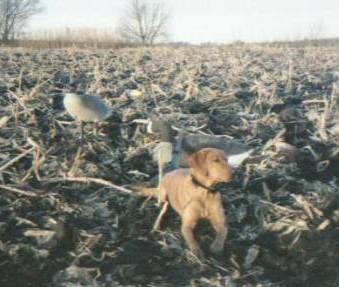 Kevin (Red Ryder) S. of Iowa is the adult in the picture. On the left is yellow SR WR CP Sarah. Seated with Kevin is son Jason. On the right is Knight, MH CP QAA. 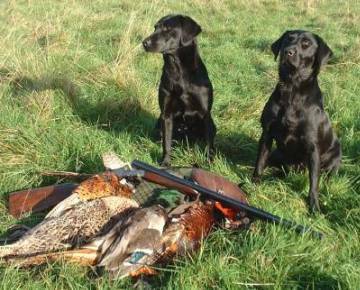 Here are a couple pics of UK labs owned by Nimrod of Ireland. Mallard on the left and a wigeon on the right. 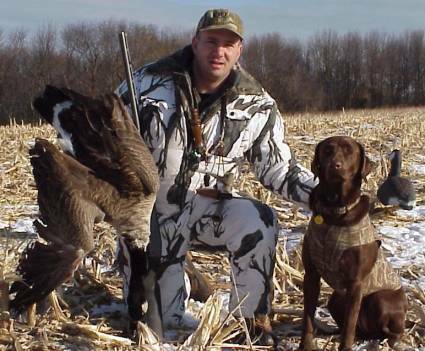 Some late season pics of Dave Weidner's New Jersey cornfield waterfowling action. 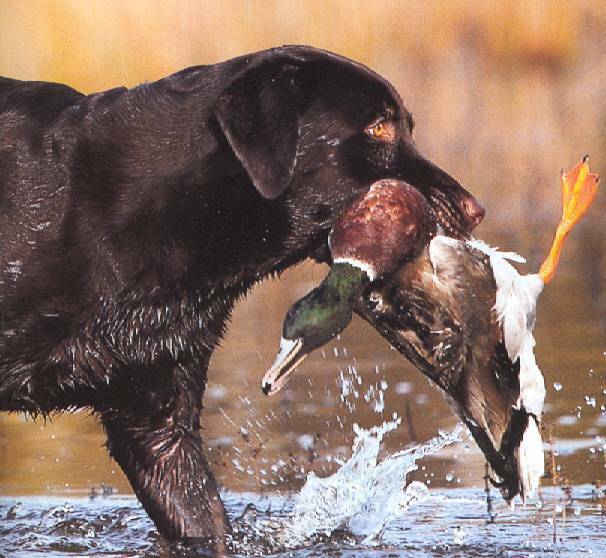 Storm retrieves a goose on the left, a drake mallard center and a team photo on the right. 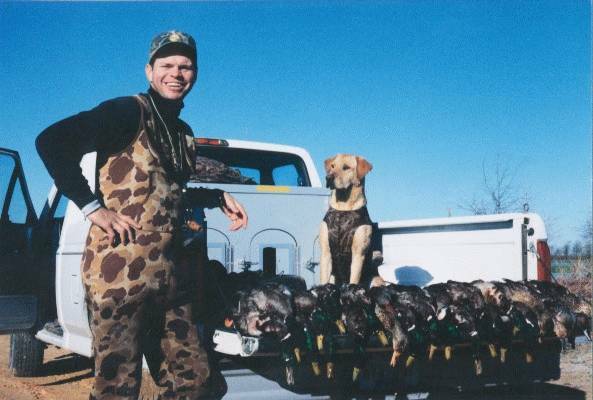 Hunting with Dave Weidner (above pics) are Greg Dwyer and his golden Rocky. In a classic, under the shell shot on the left Rocky lies in wait. On the right - SUCCESS! 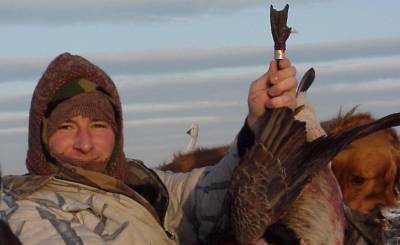 This is Greg and Rocky's first banded honker! 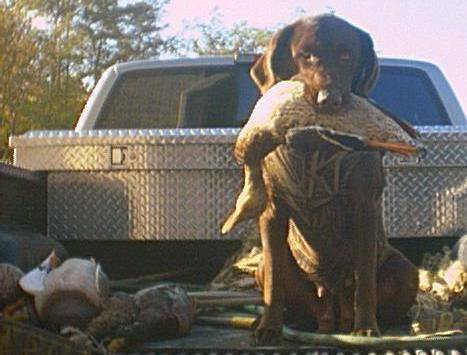 "Don't ever let anyone say you can't take field trial dogs hunting." says Pat F. of Eastern PA. Here's proof positive that dogs trained by the proverbial white coats can do very well. 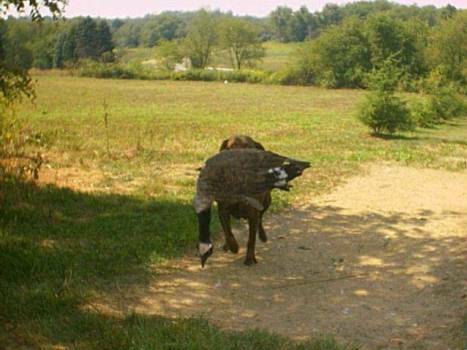 REO Speed Waggin' on his first official goose hunt. Pictured here is Yellow Sandy and black Moira owned by Bill and Cathy Genier of Granville, NY. 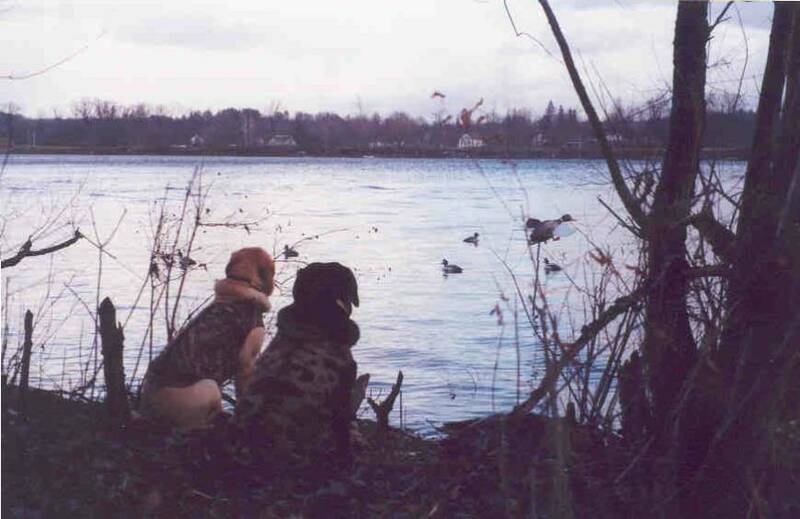 These are mother and daughter out of Bill's breedings hunting on a secret haunt on the Hudson River. Man Bill, that spot looks awful familiar. I miss it! 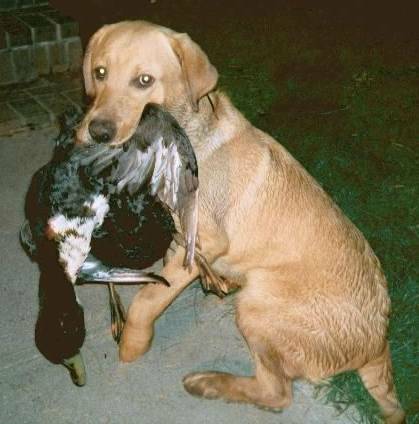 This "giant duck" was retrieved by Doc's yellow pointing lab, "Casey". Casey's boss is one of RTN's two resident chiropracters. (That we know of!) Perhaps even more lurk. If I recall correctly, this was determined to be some sort of cross between two species. Now "Judge" is a dawg you don't wanna mess with! 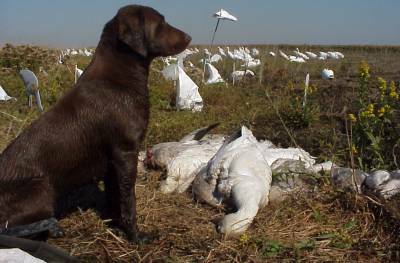 Judge and his boss do the whitecoat thing and reside in the great waterfowling state of Texas. 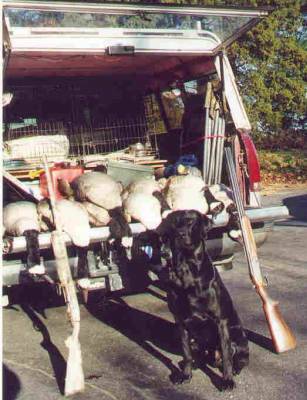 Judge keeps his boss' duckblind areas clear of intruders, as shown here. 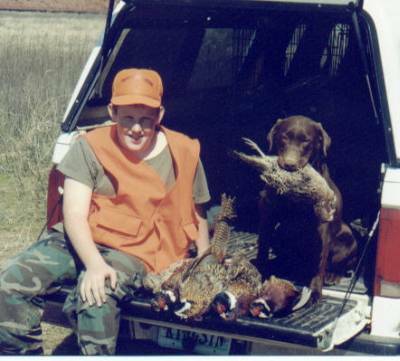 Patrick (Patch) Stambaugh (age 12) is shown here with GMHR Kingston's Ivy League after a nice day of pheasant hunting. 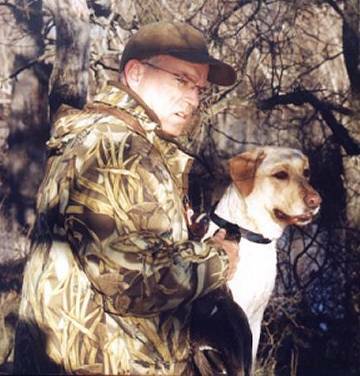 Both are "owned" by Joe and Deb Stambaugh of Kingston Kennels - Goldvein, VA. 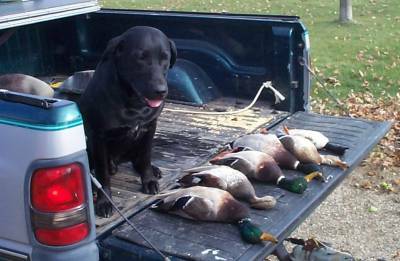 This browndawg is one of Dave Bray's breedings at Kinkade Chesapeakes, in Western PA.
Luke is shown here with a nice IL migrator and the day's take. 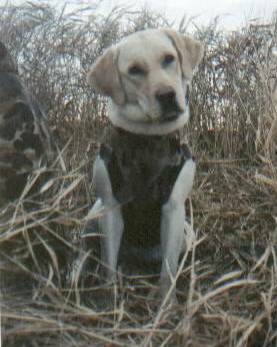 Luke is owned by Randy Butler of IL. Memories of a great day. 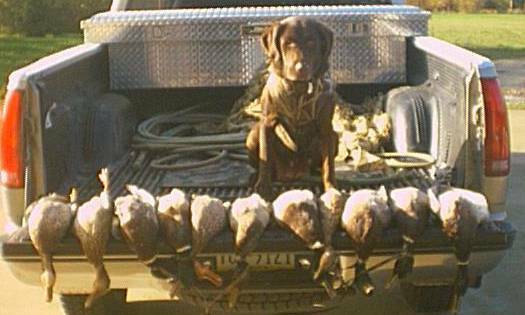 Bill Steglitz went out on the last day of the Massachusetts duck season, just him and Cooper. 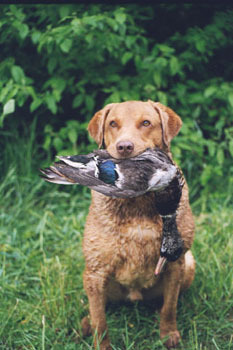 Cooper is holding an authentic Atlantic Flyway Black Duck here. 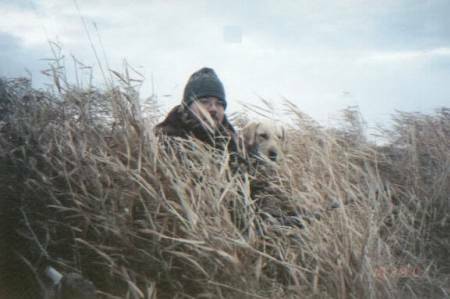 J.Paul Jackson is happy with the day's take here with Maddie after a day of Jonesboro, AR area duck hunting with clients. 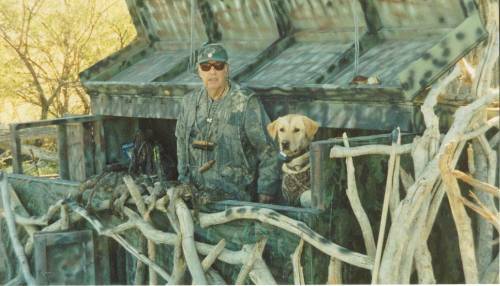 Here's Harry Harper with Gracie on their West-Central Texas duck lease in peanut country. 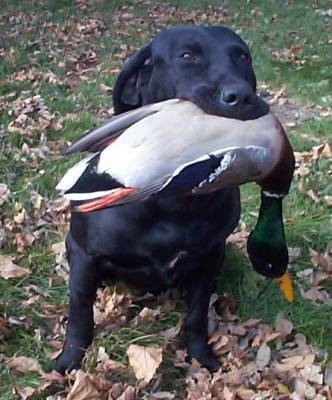 They had their best season ever there with over 400 birds taken and 4 bands. January 27, 2001. 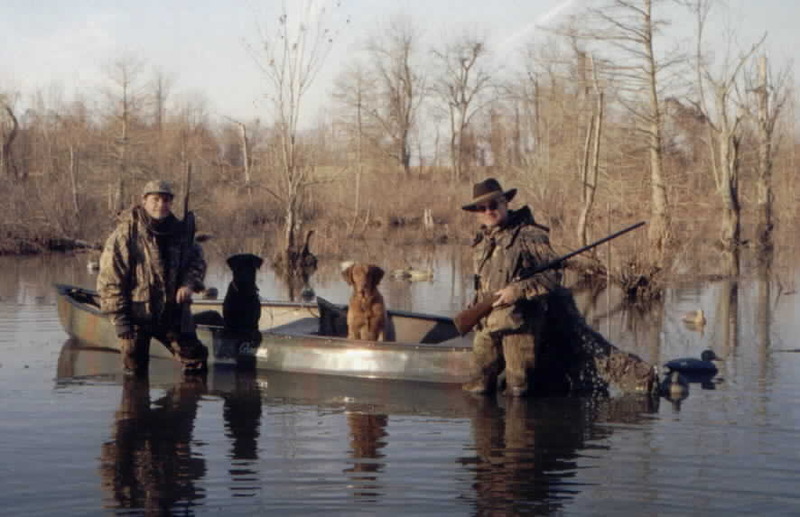 Chris Atkinson, Buster, Jake and Robert Milner on a memorable hunt at Beaverdam Duck Club in Tunica, MS. 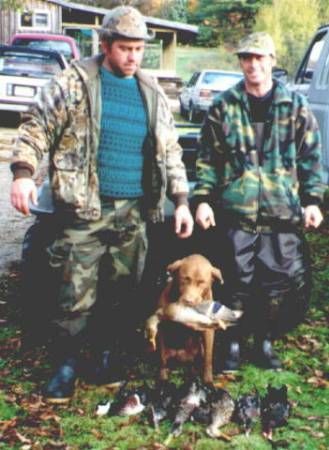 This was the final weekend of the club's existence - the longest running duck club in the United States is now done. 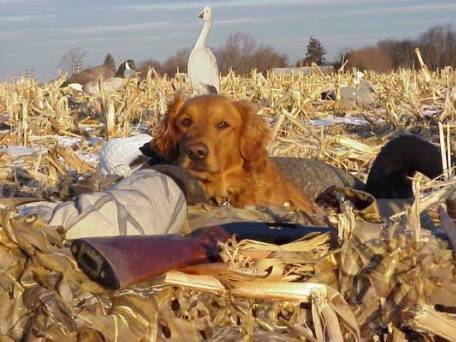 Kirk Sherbine and his lab Jake are both taking a mid-action break on one of the hottest January goose hunts of the season! This shot was taken in Somerset County and included flocks from three different bodies of water in two both Maryland and PA. Kirk and Jake are both in their own custom/home-made coffin blinds!